Geneva - Israel’s perpetual violations of Palestinian detainees’ basic rights in its jails, including ill-treatment, health negligence, repressions and assaults are deeply appalling, warns the Euro-Mediterranean Human Rights Monitor. The toll of casualties in Ketziot Prison reached 120 detainees, including those who sustained gunshot wounds. It is with great concern that we follow the escalation in Israeli prisons, in particular Ketziot (or Negev Desert) Prison, against the backdrop of Palestinian detainees protesting the installation of mobile jamming devices, threatening them with serious illnesses, added Euro-Med Monitor. Palestinian detainees’ protests were met by assault and repression on the part of the Prison Administration, with Israeli forces causing dozens of injuries in Ketziot Prison’s “Section C” on 24 March, this year. The toll of casualties in Ketziot Prison reached 120 detainees, including those who sustained gunshot wounds. The type of bullets used is new, and yet to be identified. These bullets are said to cause injuries in several areas of the body, similar to rubber bullets. A considerable number of prisoners sustained wounds in critical parts of the body, including the head, eyes, and chest, according to the Prisoners and Ex-Prisoners’ Affairs Committee. Palestinian detainees in the other sections of Ketziot Prison decided two days ago to refuse the meals presented to them, in order to allow them to visit and check on their fellow prisoners in Section C. Also worth noting here is that these detainees have previously tried more lenient ways to allow them to visit prisoners in Section C but to no avail, prompting the hunger strike. Euro-Med Monitor sent an urgent letter to the UN Special Rapporteur on torture and other cruel, inhuman or degrading treatment or punishment as well as to the International Committee of the Red Cross (ICRC), requesting the establishment of a UN commission of inquiry tasked with visiting Israeli prisons to follow on this grave incident and to monitor the situation of Palestinian detainees generally. “Hundreds of detainees in the Negev were subjected to humiliation by Israeli special operations Metzada unit. About 20 of these forces stormed Section (C), and started repressing detainees using live fire, and beating them with the backs of weapons and sticks, resulting in scores of injuries, fractures and bruises, added al-Salaymeh. “We were humiliated and insulted, and forced to stay, while handcuffed, for 12 hours in the cold and rain,” al-Salaymeh said. 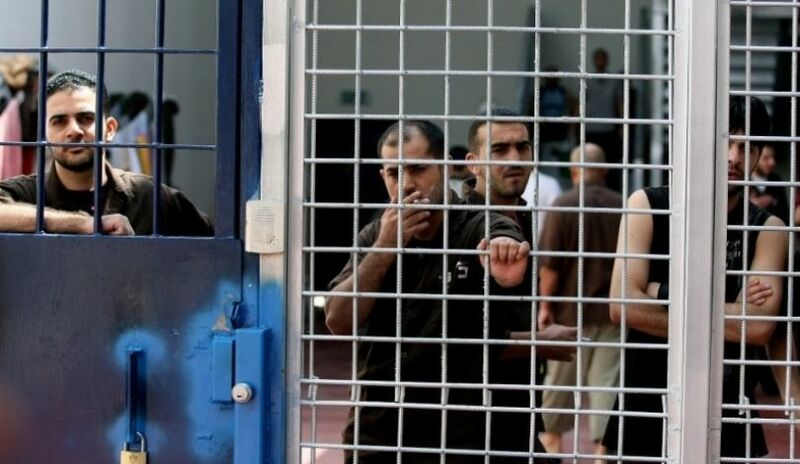 We denounce the Israeli authorities’ isolation of dozens of Palestinian detainees in Ketziot Prison under harsh and tragic conditions, said Sarah Pritchett, Euro-Med’s spokeswoman. We also condemn the way this Israeli unit dealt with prisoners, including the stripping of prisoners’ belongings, and depriving them of family visits and contact with their fellow prisoners in the other sections of the prison, added Pritchett. Israeli Minister of Internal Security decided weeks ago to deprive Palestinian prisoners of the financial assistance provided to them as a stipend by the Palestinian Authority, as well as to reduce the amount of deposits made to prisoners through the Prison’s bank account, in addition to other measures aimed at suffocating their lives. The measures of harassment and mistreatment, including physical assaults by the Israeli prison administration against Palestinian detainees, were a flagrant violation of international law and the Fourth Geneva Convention, said Pritchett. 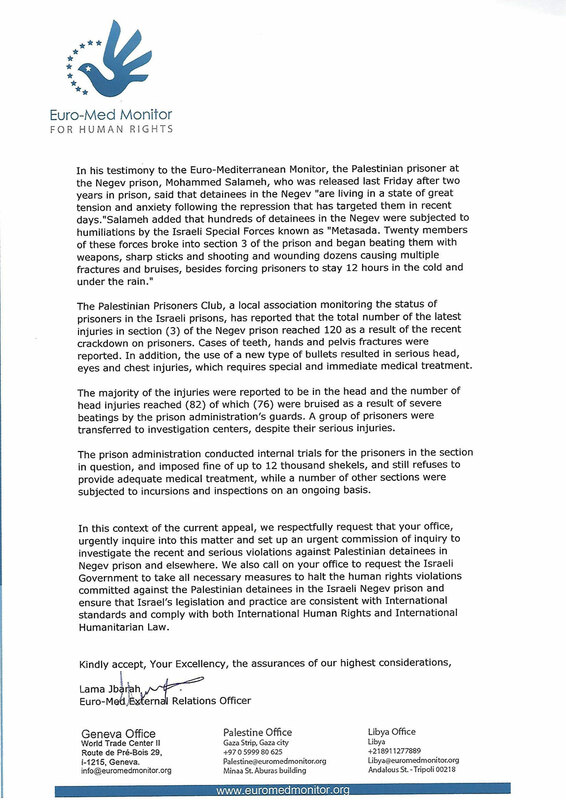 The Euro-Mediterranean for Human Rights calls on the United Nations High Commissioner for Human Rights to establish an urgent commission of inquiry in order to investigate the violations against Palestinian detainees in Israeli jails and the punitive practices against them, especially with regards to the recent crackdown. Euro-Med Monitor calls on the Israeli authorities to allow Palestinian detainees to communicate with their families and relatives, and to stop the wave of restrictions designed as a tool to punish the detainees and their families. Euro-Med Monitor also calls on the Israeli Prison Administration to extend the duration of family visits from 45 minutes to an hour and a half to allow detainees and their families more time to see each other. 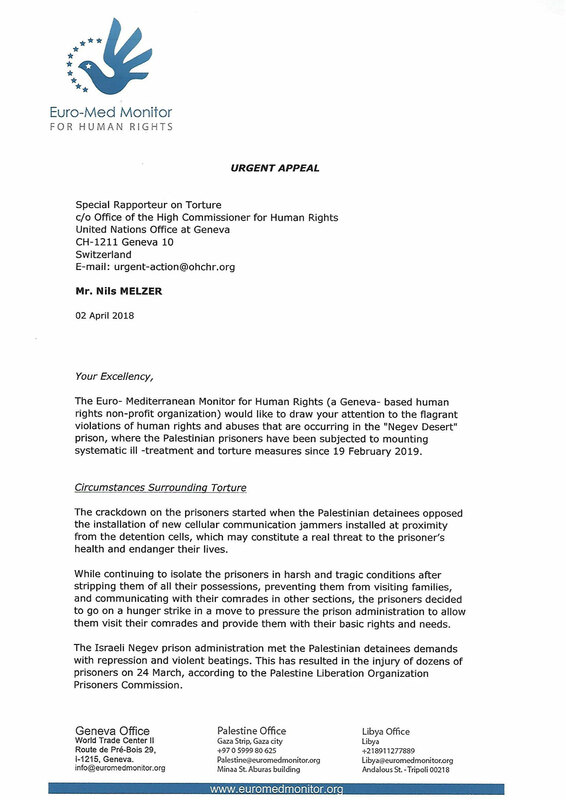 The nonprofit watchdog also call on the Prison Administration to allow detainees to enjoy a better level of medical care and to improve their health conditions, including the conduct of a monthly medical examination for all detainees, as stipulated under the Fourth Geneva Convention.